Target innovative and creative consumers who are ahead of the curve. Access a passionate global community engaged in arts and culture through our print magazine, its companion website, and monthly e-newsletter. Sponsor education initiatives and internships. 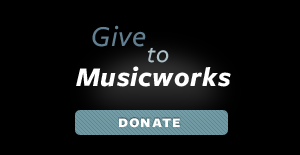 Let's have a chat and see what Musicworks can do for you. With a readership always looking to become more engaged in music and the arts, you will reach people that care about your project. A great ad campaign ensures you connect directly with a tightly-targeted audience in a trusted editorial environment. Let us build a cross-platform advertising package for you to help you expand your reach. If you're looking to engage with an audience that has a high appreciation for arts and culture, you've come to the right place. With advertisement options starting as low as $90, there is no budget too small to start a marketing campaign in Musicworks. For readership statistics, circulation information, rates and more, view our media kit below, and contact us at [email protected].